We're headed downtown for the Bulls game tonight and it's our first game of the season! Hope everyone has a great weekend. It's that time of year when the gyms are packed and everyone is excited to get in shape for summer. Here are a few tips to help you stay on track for your fitness goals! If you're dehydrated you will have less energy. If you have less energy, you won't want to workout. I find it easier to stay hydrated when I have a full water bottle next to me at all time. I love the hydraflask brand, because it literally keeps my water ice cold all day long. This seems like the most basic tip and I'm sure you've heard it a million other places, but I swear if I'm feeling like 2:30 slump and drink a bunch of water, it does wonders for my energy level. I recently teamed up with a friend to hold ourselves accountable for our workouts every day. Not only is it extra motivating, because you don't want to disappoint your friend, but it's always a great way go stay in touch. My friend lives on the other side of the country so we don't get to see each other and this is a great way to stay in touch! We are currently doing the same workout plan (BBG!) so it's nice to know that someone else is going through my same struggles. Exercise may not be something that you always enjoy or look forward to so find another aspect that could help get you excited. I've recently started listening to podcasts while I workout. I find that they're great for entertainment, but not too distracting that I don't get my workout done. I can watch TV or videos if I'm just doing a steady cardio workout, but if I'm mixing things up with intervals or weights then podcasts work out perfectly. I've recently got hooked on 'The Tim Ferris Show' podcasts where he interviews a lot of different successful people. They are long episodes so I've found that I don't always finish an episode before my workout is over and it gives me something to look forward to for my next workout. Check out the episode with Tim interviewing Arianna Huffington - it's a good one! Set a goal in mind and have a reward at the end of it. It doesn't need to be a big goal like finishing a 12 week workout plan or finishing a marathon. It can be little rewards like working out 5 days in one week and you'll have sushi on Friday night or not having a glass of wine until you've finished your daily workout. Little goals help to keep you excited and motivated. While it great to have a big goal like finishing a marathon or a 12 week workout program, that sometimes can seems daunting on a day-to-day basis. So taking a workout one day or one week at a time feels a lot more manageable. Hope this helps to get your started and keep you accountable. Happy Wednesday! 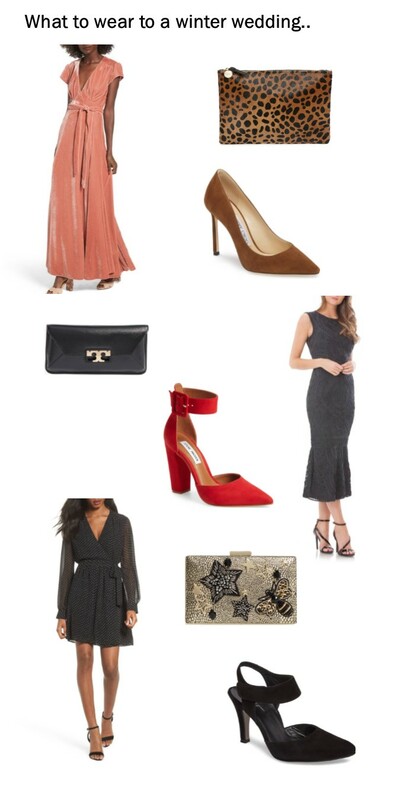 It seems like wedding season is about to start again and it's always fun to mix and match. Our first wedding reception is in a few weeks and we're excited for it to be the first wedding since our own. I linked some other cute dresses in the widget below too! I have been living in oversized sweater to get through the winter. 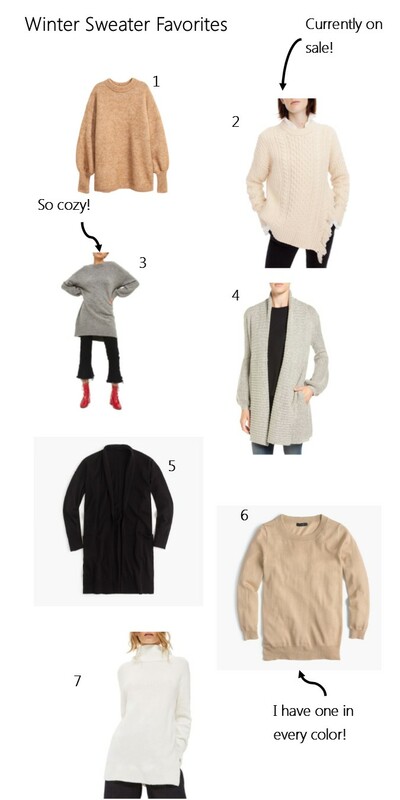 I can't stop stocking up on them, because there are so many good sweaters out right now. It looks like at least half of these sweaters are now on sale so it's a good time to stock up! 1 | Laura Mercier Skin Polish - I actually bought this exfoliator on our honeymoon in Hawaii. I naively forgot to pack an exfoliator and thought I could go without one, but after wearing a lot of makeup over our wedding weekend, I felt like my skin needed a good scrub. I use this a couple of times a week and particularly when I have been wearing a lot of makeup and feel like I need to really take off all of the extras. I love this exfoliator for winter, because it doesn't feel too rough on the skin. 2 | Philosophy Purity Cleanser - This is an oldie, but goodie. I have been trying a bunch of new cleansers over the past year and landed back at this one. There is a reason why it comes so highly recommended and has such good ratings. It really does the work in taking every last bit of make up off your face at the end of the day without feeling overly drying or stripping of your skin. 3 | Youth to the People Serum - I started using this serum day and night a couple of month ago and feel like it has really evened out my skin tone. I love that it is super hydrating since it has hyaluronic acid in it and also very brightening with the vitamin C that is included. A little goes a long way with a serum so I don't mind spending a little more knowing that it will last me a long time. 4 | Bobbi Brown Moisturizer - I use this every morning and love it for the winter. It is a little thicker of a moisturizer than I typically wear, but love the extra hydration and SPF that this provides. It's expensive, but you don't need much. I have had the same bottle for 3 months now and barely made a dent. 5 | La Mer Tonic - Whether or not you need to use a toner is up for debate, but if you do, this one is my latest love. I should be more religious about using this, but definitely feel myself grabbing for it on a night that I wore more make up than usual. It feels like one extra step to help ensure that you got all of your make up off before bed. You'd be surprised what is left on your face even after exfoliating. I've had the same bottle for almost 8 month now, but love trying new products so may try a different toner next! 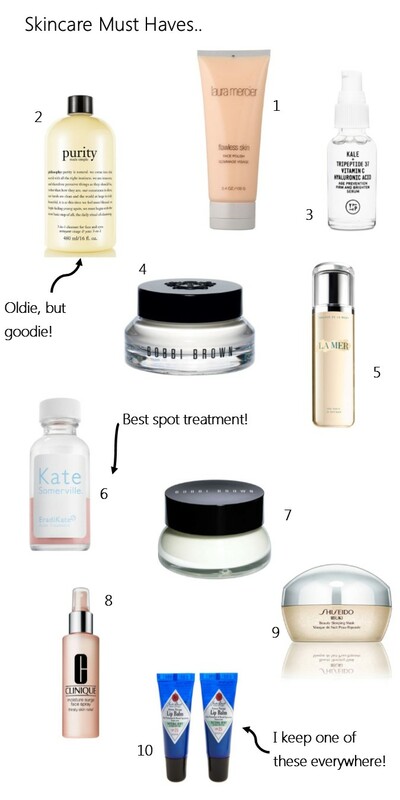 6 | Kate Somerville Spot Treatment - If you struggle with acne at all, you NEED this treatment. It literally is a miracle worker. I've tested a lot of products over the last 15 years of struggling with my skin and this is the only one that I have found you could see changes overnight. I've had my skin under control lately, but have to have this on hand as a safety net. 7 | Bobbi Brown Eye Cream - I received a sample of this about a year ago and knew I would be buying the full size. This eye cream is thick and hydrating, but not too thick to wear under concealer. It's great for day and night. 8 | Cinique Moisture Surge Face Spray - This spray is such a good refresh, especially in the winter months. This spray is easy to add throughout the day when you need a quick refresh. It's great to set makeup or put on to give extra hydration at the end of the day. I sometimes even use it when I wake up in the morning before an early morning workout when I want some quick hydration and want to wake up. There are a lot of good face sprays on the market lately, but I think this one is the most hydrating. 9 | Shiseido Sleeping Mask - I LOVE this sleeping mask. I have been using it nightly for months. It is so hydrating without feeling sticky or thick. It is quick the sink into the skin so you don't feel like your face is going to stick to your pillow case and wake up feeling extra hydrated. 10 | Jack Black Intense Therapy Lip Balm - My favorite flavor is the 'Shea Butter & Vitamin E'. I keep a tub of this in my car, next to the bed, at my desk, in every purse, in every coat jacket... you get the idea. The texture is smooth and it has staying power. I also love that it has SPF included so I know my lips are taken care of. This stuff has really helped my lips during these cold winter months. Happy Friday! I'm so excited to have a 3 day weekend this weekend. We have no big plans so it will be nice just to relax at home. 1 Hanky Panky "I Do" - Something blue and says I do, I thought this was perfect for the wedding day! 2 Gabby Satin Kimono Robe - I wanted something that would look good in pictures since the photographer would be there while I was getting ready. I wore matching little shorts under this just to make sure I was comfortable! 3 Ralph Lauren Collar Robe - I wanted something that would be cute for my friends and family to wear while they were getting their hair and makeup done too. I didn't have a bridal party, per se, but I did have plenty of family included in hair and make up. Since they all had matching robes, we were able to take a cute group photo too! 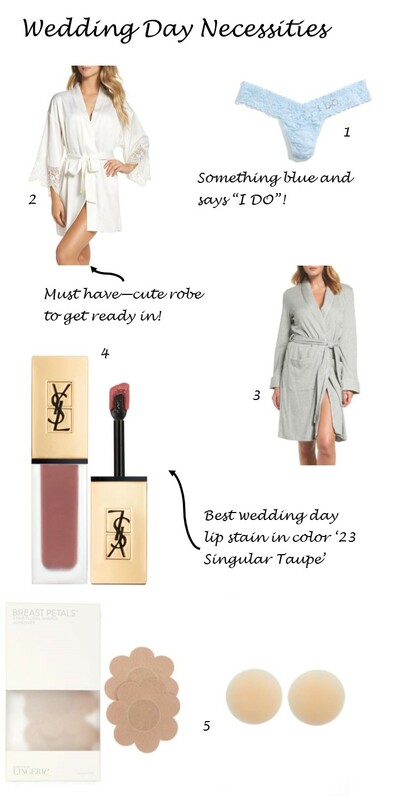 4 Yves Saint Laurent Tatouage Couture Liquid Matte Lip Stain - I was on the hunt for the perfect wedding day lip color months before my wedding. I wanted something that would stay on all day and not rub off. I "tested" a few different lip stain and this one was a clear winner in the color '23 Singular Taupe'. 5 Nippies - Now most brides don't need to wear anything on their wedding day and my dress was not particularly revealing, but I just felt more comfortable in my robe getting ready and putting on my wedding dress in front of a lot of people having these on. Plus they're great staples to have in your wardrobe and you can easily reuse them again. Happy Friday! We made it to the weekend! This seemed like an oddly long week considered it was a short week. Hope everyone has a productive first week in 2018. These items have all been on repeat for me lately, especially with all of this cold weather we have been having. 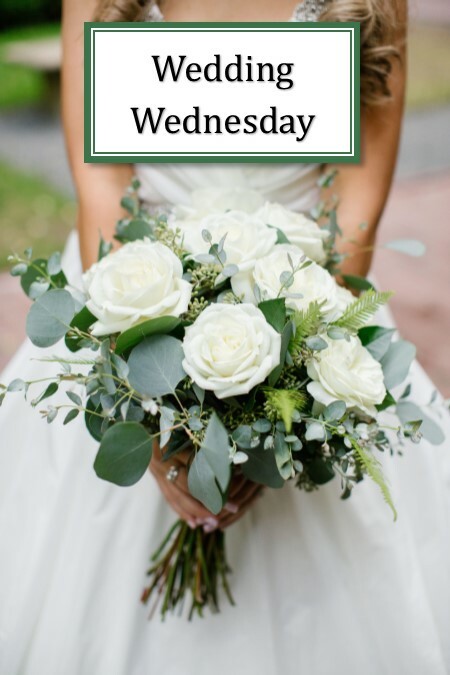 I thought it would be fun to start a wedding Wednesday series on the blog. Seeing that I just got married in November 2017, and so much goes into wedding planning, this will give me a place to share all of the details. So let's start with our wedding showers! We were so lucky to have 2 wedding showers and both of them that we got to experience together! The first shower was with all of our friends at a bar patio in downtown Chicago. We had such a great time and it was a great opportunity for a lot of our friends to meet before our big day! We lucked out with perfect weather and it was a great way to kick off our wedding celebrations. I'll link what I'm wearing if I can find it online or else I'll link similar items! Our second shower was with some more friends a family hosted by our lovely mothers! These showers got us really excited for our big day! If you're getting married in 2018, below are a bunch of white dress, wedding shower ideas. I know it took me months to decide on my dresses and then for this second shower, I changed my mind at the last minute, because it ended up being so hot outside! It's good to buy a bunch of options early on, because chances are you end up choosing one that you maybe didn't originally think you would wear! Hope this helps if you have a wedding shower in 2018! !